Located on the Historic Medina Square in Medina, Ohio we have a passion for providing our customers with an irresistible treat. Each apple is carefully chosen and hand-dipped in over 50 different flavor combinations. We take great pride in crafting a one-of-a-kind confection. 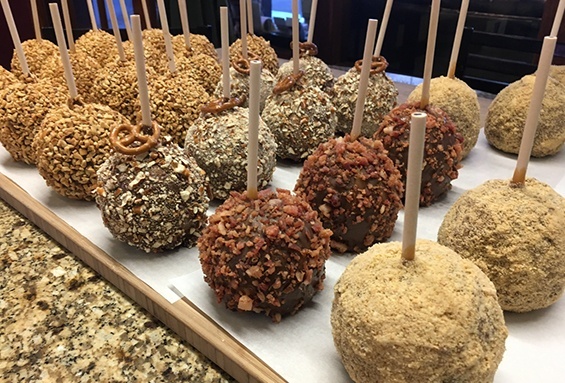 Our gourmet caramel apples are made to match any holiday, event, or social gathering. With our dedication to complete customer satisfaction, we guarantee to deliver excellent handmade specialty desserts that will have you wanting more. The apple is a symbol of knowledge. When cutting through an apple it has a near perfect pentagram shape inside. Guided by our dedication to knowledge and excellence, we use only the finest ingredients and satisfaction is always guaranteed.